No one resolves to their name... only phone numbers are listed for the other person in the conversation. This includes people I've sent messages to or received. When I sent a message, I can find the person by name & autocomplete, but when I accept the person from autocomplete, it resolves to their number. All recipients show up as red... for instance if you hover over the name/number, usually it shows a blue selection box, but for me they are all red. I've tried signing out & back in, but that didn't work. I don't have any contacts in iCloud as I am on a hosted Exchange (Office 365) where all my contacts are. This is how it was setup since I got my MBP 1yr ago so I know this works and it still works on my iOS devices. Everything I've seen talks about syncing your contacts to iCloud... but I've never needed to do that in the past and even when I manually copy one contact over, that has their name, email & correct phone number, it still won't resolve them to their name, only their number. On iOS there's an app called OWA. 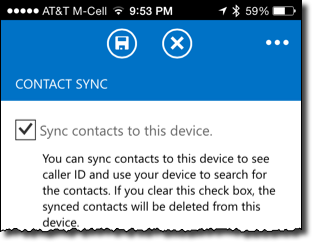 Within the app there's a setting within the People section for sync'ing your contacts. Basically it creates a new group in your iCloud called OWA that is a carbon copy of your contacts. Once I turned this on and saw it sync with my laptop, I got my names resolved and showing in iMessage again! I have documented a more complete explanation and resolution in Resolving Contacts Sync on OS X - Error SOAPWebServicesErrorDomain. Not the answer you're looking for? Browse other questions tagged macos yosemite messages ios .